I’ve long been convinced that training zones were designed to make me feel inadequate – I’m working hard, it’s not very comfortable, but apparently it’s ‘easy’, or worse I’m ‘recovering’. Those occasions when everything actually feels easy are amazing, and unfortunately rare. Trying to relate heart rate zones to perceived exertion is a nightmare, and that’s before I’ve thrown power or pace into the mix; consulting online guides only confirms my apparent shortcomings. My solution is to stop trying – I’ve stopped looking at my heart rate, though I still glance at pace or power, but mostly I worry about how it feels. I don’t stress about zones, when I need to work hard I make sure it feels hard and when I need to go easy I make sure it feels easy. Of course the many charts and analyses in this blog are a testament to the fact I do still worry; not in the moment, but after the fact, then I study the numbers to gain an awareness of where I stand. At some point we all need reassurance that we’re training appropriately, whether that’s best achieved through race results, test results or through micromanagement of how we train is a more pertinent question. For me race results and occasional reviews of training data are sufficient, but not everyone likes such a casual approach. Coaching has pulled me back into the mess of training zones. The numerous systems may frustrate me, but they serve a purpose – communication. What do terms like recovery, easy, steady, hard, threshold, or max effort mean? Every athlete has their own interpretation, many need a precise definition. If you’ve invested in a coach you want to be certain you’re training correctly. A lot of my communication, especially in the early days of a coaching relationship, focuses on training zones and intensity. It’s not just a question of how hard to train, it’s how to measure it. There are numerous ways to measure effort – power, pace, heart rate, RPE – and they don’t necessarily agree; where one system says we’re on target, another claims it’s too much. My own training data confirms as much. 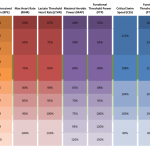 A comparison of heart rate and power during 2009 (data I had to hand) show clear signs of the disparity between my heart rate zones and my power zones. 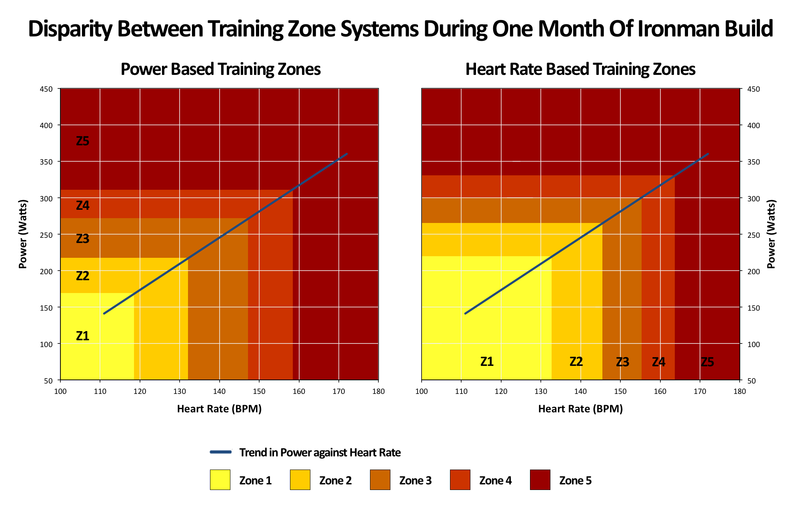 On the left I divide the chart by Friel’s power zones (derived from Coggan’s zones) and on the right Friel’s heart rate zones, unsurprisingly they match poorly. Where power is simply the work we are doing, heart rate is a response to it, it lags and is influenced by external factors and our own condition, the correlation between the two is weak. So back in 2009 heart rate zone 1 encompassed both power zones 1 and 2, and heart rate zone 2 was more comparable to power zone 3. No wonder I felt inadequate! Two years on, I’m sure the relationship looks different. So how to deal with this? Follow one system – if you have power use power, if you have pace use pace and if you only have heart rate use heart rate; even then always be aware of feel (RPE). The relationships may – at times – be weak, but none of these measures stand in isolation, there is a slight hierarchy rather than a union, but it pays to be able to observe them all. 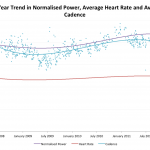 After years of doing that, I came to the conclusion that while heart rate and power often disagreed, how I felt was rarely wrong.